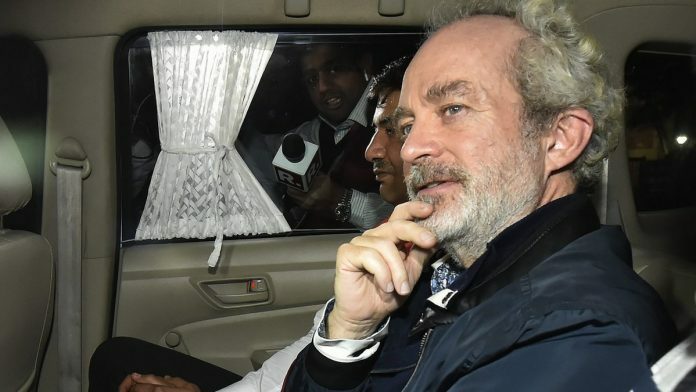 Said to be a key accused in the Rs 3,600 crore AgustaWestland scam, Christian Michel James arrived in India Tuesday night. New Delhi: British national Christian Michel James, a suspected middleman and key accused in the Rs 3,600 crore AgustaWestland VIP chopper deal case, was extradited by UAE authorities to India late Tuesday. Michel, who is accused of receiving kickbacks from the Anglo-Italian helicopter manufacturer to sway the 12-helicopter deal in its favour during the UPA era, had been under detention in Dubai. He was brought to Delhi in a private jet and then taken into custody by the CBI. Seen as a big win for the Narendra Modi government, this is the first extradition the agency has been able to secure in the case. The CBI subsequently issued a statement saying the entire operation was carried out under the guidance of national security adviser Ajit Doval, and coordinated by the agency’s interim director M. Nageswara Rao along with CBI joint director A. Sai Manohar. While the agency termed it a success, James had earlier alleged political motivations to the move, accusing the Modi government of making him a “scapegoat” before the general elections. Given the sensitivity of the matter, James will be kept at the CBI headquarters and not be sent to judicial custody. He will be produced at the Patiala House Courts Wednesday morning. “He will be examined with respect to his involvement in the case and confronted with documents recovered during raids by Swiss authorities, indicating that he bribed Indian authorities for securing the contract for supply of VVIP helicopters,” a CBI officer said. Who is Christian Michel James? James is a consultant of AgustaWestland, UK, who enjoys technical operational knowledge of the aircraft, the military bases as well as the pilots. It was in the 1980s that he first joined the firm, taking a job with its predecessor Westland Helicopters Limited (WHL), UK. The AgustaWestland deal, signed under the UPA in 2010 but scrapped later, pertained to the purchase of 12 helicopters for use by Indian VIPs. It is alleged that a nexus involving AgustaWestland middlemen, IAF officials and Indian government officers conspired to get the parameters of the tender for maximum altitude tweaked to help the firm bag the contract. According to sources, James was a frequent visitor to India, operating as a middleman for defence procurements through a network of sources he had cultivated in the IAF and the Ministry of Defence (MoD) at different levels, including retired officials. “He was tracking the movements of the procurement process files and was sending periodical reports and despatches on the developments to the accused persons connected with AgustaWestland,” an officer said. The chargesheet of the case — which runs into 30,000 pages — mentions that the CBI identified the trail to €62 million and that the AgustaWestland deal resulted in the wrongful loss of €398.21 million to the Indian exchequer. Apart from James, the chargesheet names former IAF chief S.P. Tyagi, Air Marshal J.S. Gujral (retired), Tyagi’s cousin Sanjeev Tyagi, and advocate Gautam Khaitan. Among the foreign nationals listed are former Finmeccanica chairman Giuseppe Orsi, former AgustaWestland CEO Bruno Spagnolili, Guido Ralph Haschke and Carlo Gerosa. According to CBI, because of his expertise in engineering, James was a part of the conspiracy to reduce the flying height for the VIP helicopters from 6,000 metres to 4,500 metres. This allegedly allowed AgustaWestland to come into the picture as its helicopters earlier did not qualify for the submission of bids, and subsequently bag a €556.26 million contract from India on 8 February 2010. Investigators also alleged that Michel paid off influential people in India, who helped reject the Russian and American choppers. According to sources, it was during a meeting in Italy in July 2006, in the presence of Orsi, where it was decided that James will work together with Haschke and Carlo Gerosa in carrying out scouting and monitoring activities with regard to the acquisition of helicopters in India. This decision was inspired by James’ knowledge of the Indian military. “During the meeting, they had negotiated a comprehensive fee equal to 7 per cent of the supply contract amount,” a source said. According to investigators, at the time, James entered into as many as 12 contracts through two of his firms — Global Trade & Commerce Ltd London and Global Services FZE, Dubai — with Finmeccanica and its subsidiary AgustaWestland in order to legitimise the commission he had made on the Indian deal. “An amount of €42.27 million (Rs 295 crore approx.) was paid by the Finmeccanica Group to James’ firms as kickbacks,” a source said. The alleged involvement of James in the deal surfaced in 2012. Investigations revealed that he allegedly acted as a middleman to sway the deal in favour of AgustaWestland and paid kickbacks to the Indians involved. Initially, the investigation conducted by Italian authorities indicted him for offences of international bribery and corruption, following which the CBI too started a probe against him. However, before he could be arrested, he escaped from India. Several summons were sent to him to join the probe. However, when he failed to do so, an open non-bailable arrest warrant was issued against him in September 2015. On the basis of the non-bailable arrest warrant, Interpol too issued a Red Corner Notice (RCN) against him. In February 2017, James, who was travelling through the UAE, was arrested there on the basis of the RCN. Seven months later, in September 2017, the CBI filed a chargesheet against James and 11 others, following which an extradition request was forwarded to the UAE. “The trial court took cognisance of the offences in October 2017, after which the CBI’s request for extradition was forwarded to the UAE authorities on 19 March 2018 through diplomatic channels,” a CBI officer said.